Pic ESA scientists are still a bit baffled about just how they managed to land their Philae probe on the surface of Comet 67P after the craft's harpoons failed to fire into the rock. And they think it’s possible Philae landed not once, but twice. It's the first time ever humanity has set down on a comet – and this one's 500 million kilometers away, heading towards our Sun. Philae’s manager Dr Stephan Ulemac, of Germany's space agency DLR, said in the final briefing of the day, here in at mission control in Darmstadt, that European Space Agency staff and other Rosetta and Philae scientists were still working on the data to figure it out. “It’s complicated to land on a comet and it’s not only complicated to land there, it’s also very complicated to understand what happened after landing,” he said. Although it’s not good news to know that the harpoons aren’t anchoring Philae in place on the Agilkia landing site, the team is still optimistic. Dr Ulemac said it's believed the lander may have touched down once and then bounced very slowly off the surface, before landing yet again. “We have had fluctuations in the radio link. The signal always came back again immediately and we were always again receiving science data,” he said. “Some of this data indicated that the lander may have lifted off again … [that] we touched down and then we were bouncing, very gently. What we saw was fluctuations in the radio but also in the solar cell, which could be interpreted as the lander touching down and then lifting off and turning itself, because the flywheel was shut off on landing … after two hours, this indication stopped … so maybe we landed today not once but twice." Philae’s flywheel was part of its landing gear and stopped the craft from rotating while it was operational, but it was switched off once the probot indicated it had touched down. Despite the unorthodox landing, the mood at mission control is one of celebration – and neither Dr Ulemac nor operations director Paolo Ferri expressed any fears for the craft. The Agilkia site is within a landscape of deep pits and boulders; it was chosen not just for its relatively uncluttered look, but also in the hopes that there was sand there to break Philae’s fall. Given the soft impact registered by the legs on touchdown, that seems likely. Meanwhile, Philae’s mothership satellite Rosetta is out of contact for the next few hours after dipping behind the horizon of the comet, during which time it has a planned maneuver to make. 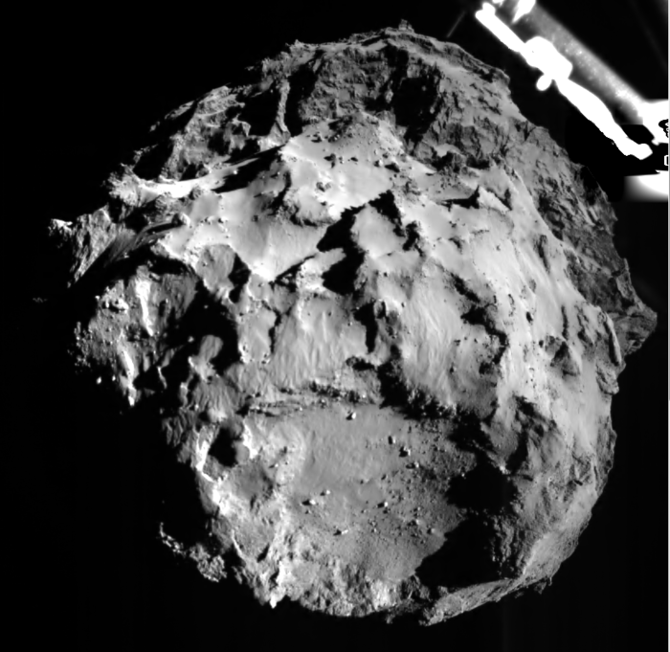 One piece of definite good news is that Philae landed fairly precisely, as shown by the image taken with its ROLIS camera just 3km from touching down.